Herman Goldstine at Princeton Institute for Advanced Study. 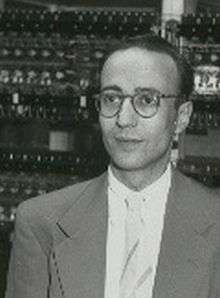 Herman Heine Goldstine (September 13, 1913 – June 16, 2004) was a mathematician and computer scientist, who was one of the original developers of ENIAC, the first of the modern electronic digital computers. Herman Heine Goldstine was born in Chicago in 1913 to Jewish parents. He attended the University of Chicago, where he joined the Phi Beta Kappa fraternity, and graduated with a degree in Mathematics in 1933, a master's degree in 1934, and a PhD in 1936. For three years he was a research assistant under Gilbert Ames Bliss, an authority on the mathematical theory of external ballistics. In 1939 Goldstine began a teaching career at the University of Michigan, until the United States' entry into World War II, when he joined the U. S. Army. In 1941 he married Adele Katz, who was an ENIAC programmer and who wrote the technical description for ENIAC. He had a daughter and a son with Adele, who died in 1964. Two years later he married secondly Ellen Watson. In retirement Goldstine became executive director of the American Philosophical Society in Philadelphia between 1985 and 1997, in which capacity he was able to attract many prestigious visitors and speakers. Goldstine died on June 16, 2004 at his home in Bryn Mawr, Pennsylvania, after a long struggle with Parkinson's disease. His death was announced by the Thomas J. Watson Research Center in Yorktown Heights, New York, where a post-doctoral fellowship was renamed in his honor. As a result of the United States' entering World War II, Goldstine left the University of Michigan where he was a professor in July, 1942 to enlist in the Army. He was commissioned a lieutenant and worked as an ordnance mathematician calculating firing tables at the Ballistic Research Laboratory (BRL) at Aberdeen Proving Ground, Maryland. The firing tables were used in battle to find the appropriate elevation and azimuth for aiming artillery, which had a range of several miles. The firing table calculations were accomplished by about one hundred women operating mechanical desk calculators. Each combination of gun, round and geographical region required a unique set of firing tables. It took about 750 calculations to compute a single trajectory and each table had about 3,000 trajectories. It took human computer at least 7 hours to calculate one trajectory. To increase production, BRL enlisted the computing facilities of the Moore School of Electrical Engineering at the University of Pennsylvania and Goldstine was the liaison between BRL and the university. While making some adjustments to the Moore School's differential analyzer, engineer Joseph Chapline suggested Goldstine visit John Mauchly, a physics instructor at the Moore School, who had distributed a memorandum proposing that the calculations could be done thousands of times faster with an electronic computer using vacuum tubes. Mauchly wrote a proposal and in June 1943 he and Goldstine secured funding from the Army for the project. The ENIAC was built in 30 months with 200,000 man hours. The ENIAC was huge, measuring 30 by 60 feet and weighing 30 tons with 18,000 vacuum tubes. The device could only store 20 numbers and took days to program. It was completed in late 1945 as World War II was coming to an end. In spite of disappointment that ENIAC had not contributed to the war effort, interest remained strong in the Army to develop an electronic computer. Prior even to the ENIAC's completion, the Army procured a second contract from the Moore School to build a successor machine known as the EDVAC. Goldstine, Mauchly, J. Presper Eckert and Arthur Burks began to study the development of the new machine in the hopes of correcting the deficiencies of the ENIAC. Herman Goldstine at The Princeton Institute for Advanced Study. (Left to right: Julian Bigelow, Herman Goldstine, J. Robert Oppenheimer, and John von Neumann). In the summer of 1944 Goldstine had a chance encounter with the prominent mathematician John von Neumann on a railway platform in Aberdeen, Maryland, and Goldstine described his project at the University of Pennsylvania. Unknown to Goldstine, Neumann was then working on the Manhattan Project, which was aiming to build the first atomic bomb. The calculations needed for this project were also daunting. As a result of his conversations with Goldstine, Neumann joined the study group and wrote a memo called First Draft of a Report on the EDVAC. Neumann intended this to be a memo to the study group, but Goldstine typed it up into a 101-page document that named Neumann as the sole author. On June 25, 1946, Goldstine forwarded 24 copies of the document to those intimately involved in the EDVAC project; dozens or perhaps hundreds of mimeographs of the report were forwarded to Neumann's colleagues at universities in the United States and in Great Britain in the weeks that followed. While incomplete, the paper was very well received and became a blueprint for building electronic digital computers. Due to Neumann's prominence as a major American mathematician, the EDVAC architecture became known as the von Neumann architecture. One of the key ideas in the "first draft" was that the computer would store a program in its electronic memory, rather than programming the computer using mechanical switches and patch cables. This and other ideas in the paper had been discussed in the EDVAC study group before Neumann joined the group. The fact that Eckert and Mauchly, the actual inventors and designers of the ENIAC, were not named as co-authors created resentment that led to the group's dissolution at the end of the war. Eckert and Mauchly went on to form the Eckert-Mauchly Computer Corporation, a company that in part survives today as the Unisys Corporation, while Neumann, Goldstine and Burks moved on into academic life at the Institute for Advanced Study. 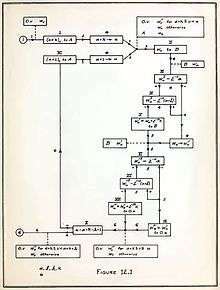 In Summer 1946, all of them were reunited to give presentations at the first computer course, which has come to be known as the Moore School Lectures; Goldstine's presentations, given without notes, covered deeply and rigorously numerical mathematical methods useful in programs for digital computers. After World War II Goldstine joined Neumann and Burks at the Institute for Advanced Study at Princeton, where they built a computer referred to as the IAS machine. Goldstine was appointed as assistant director of the project and was later its director, after 1954. The IAS machine influenced the design of IBM's early computers through Neumann, who was a consultant to IBM. When Neumann died in 1958, the IAS computer project was terminated. Goldstine went on to become the founding director of the Mathematical Sciences Department at IBM's Watson Research Center in Yorktown Heights, New York. At IBM one of Goldstine's most significant roles was in fostering relations between IBM researchers and the academic community. In 1969 he was appointed an IBM Fellow, the company's most prestigious technical honor, and a consultant to the director of research. As a fellow Goldstine developed an interest in the history of computing and mathematical sciences. He wrote three books on the topic; The Computer from Pascal to von Neumann, History of Numerical Analysis from the 16th Through the 19th Century and History of the Calculus of Variations from the Seventeenth Through the Nineteenth Century. As the title implies, in The Computer from Pascal to von Neumann, Goldstine leaves little doubt that in his opinion von Neumann played a critical role in developing modern theories of computing. Benjamin Franklin Medal for Distinguished Achievement in the Sciences of the American Philosophical Society (1997). Goldstine, Herman H.; Goldstine, A. (1982) . "The Electronic Numerical Integrator and Computer (ENIAC)". The Origins of Digital Computers: Selected Papers. New York: Springer-Verlag. pp. 359–373. ISBN 3-540-11319-3. Goldstine, Herman H. (1980-10-01). The Computer from Pascal to von Neumann. Princeton, NJ: Princeton University Press. ISBN 0-691-02367-0. Goldstine, Herman H. (1973). New and Full Moons: 1001 B.C. to A.D. 1651. Philadelphia: American Philosophical Society. ISBN 0-87169-094-2. Goldstine, Herman H. (1977). History of Numerical Analysis from the 16th Through the 19th Century (Studies in the History of Mathematics and Physical Sciences, 2). New York: Springer-Verlag. ISBN 0-387-90277-5. Goldstine, Herman H. (October 1980). History of the Calculus of Variations from the Seventeenth Through the Nineteenth Century (Studies in the History of Mathematics and the Physical Sciences). New York: Springer-Verlag. ISBN 0-387-90521-9. Bernoulli, Jakob; Bernoulli, Jean; Goldstine, Herman H.; Radelet-de Grave, P. (September 1991). Die Streitschritfen Von Jacob Und Johann Bernoulli: Variationsrechnung. Basel; Boston: Birkhäuser. ISBN 3-7643-2348-5. ISBN 0-8176-2348-5. ↑ Herman H. Goldstine, Remembrance of Things Past from "A History of Scientific Computing"
Oral history interview with Herman H. Goldstine. Charles Babbage Institute, University of Minnesota. Goldstine discusses his experiences with the ENIAC computer during World War II. He mentions the EDVAC, the ENIAC's successor, and its innovation of stored programming, for which he credits John von Neumann. Kempf, Karl (1961). "Chapter 2: ENIAC". Electronic Computers Within The Ordnance Corps. Aberdeen Proving Ground, MD. O'Connor, John J.; Robertson, Edmund F., "Herman Goldstine", MacTutor History of Mathematics archive, University of St Andrews . DeAngelis, Gina; Bianco, David J. (2005). Computers: processing the data. Minneapolis: Oliver Press. ISBN 1-881508-87-0.